Retro and ’70s are something that we hear about every second now; they have seized the fashion world and do not yet seem to think of giving up. We are not particularly against that as long as fashion houses and brands release pieces that just blow our minds. Our very favorite Swedish high-street brand has come up with a new enchanting collection to take us into the lovely days of old Hollywood movies creating an advertising campaign with the theme. 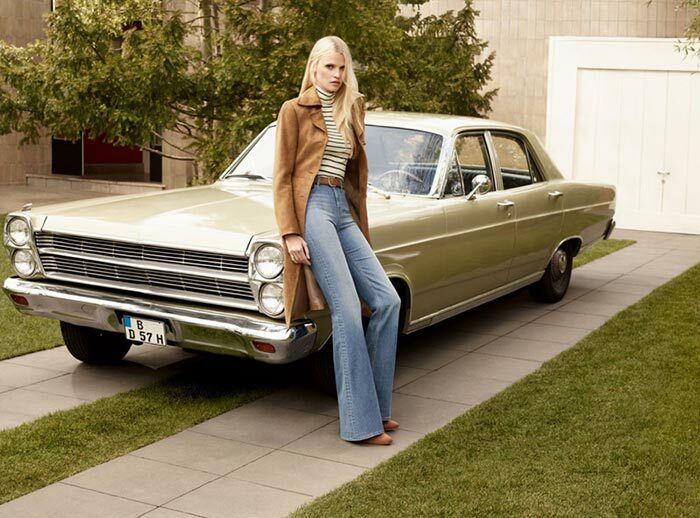 The gorgeous Dutch model Lara Catherine Stone appears in the latest H&M fall 2015 campaign pictures posing next to a retro Ford Galaxie 1967 with the stunning pieces on. The images are as always unimaginable offering much while showcasing little. Certainly you have already seen the H&M Studio fall 2015 campaign with Edie Campbell starring in the images, haven’t you? This new line for fall is its logical continuation giving you a more precise and richer choice of amazing pieces. Rocking flared suede pants, striped blouses and printed overalls the blonde makes us dream to have them. It is quite surprising how such a simple background might inspire us: the place for the images taken looks exactly like the front yards of American houses a couple of decades ago, which recreates the nostalgic feelings we had when watching movies of that time. Anyway, Lara goes perfectly with it highlighting interesting outfits: look at the one where she is leaning on the car wearing belted bell-bottom denim pants with a horizontal-striped blouse topped with knee-length trench coat ” we would die for those crazy long legs and her spunky expression. Another winning outfit for chic fall days is the blue V-neck sleeveless overall that again has flared legs. The line has a reserved long-sleeve knee-length blue dress of a similar pattern, which goes perfectly with the peanut suede long boots that the model sports in one of the images. We also love the simple match of white halter blouse with high-waist wide-leg caramel brown pants. No less curious is the match of straight denim capris with the long-sleeve buttoned light grey shirt-dress belted on the waist, gingerbread swede boots and a caramel-brown satchel bag to carry your belongings. For a more convincing look, the makeup and hair are done in the spirit of the ’70s: brown smokey eye and naturally loose straight hair will make you look effortlessly cool without trying too hard. We love this minimalistic and retro feel that H&M gives us through its fall campaign. We cannot wait until August 20 for the collection to hit the stores so that we could get our favorites and look just as chic and fabulous as Lara does in the pictures.